Greetings and Blessings to all of you in the Name of our Lord and God and Savior Jesus Christ! 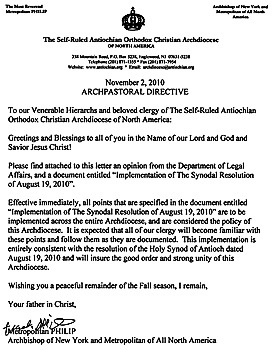 Please find attached to this letter an opinion from the Department of Legal Affairs, and a document entitled “Implementation of The Synodal Resolution of August 19, 2010”. Effective immediately, all points that are specified in the document entitled “Implementation of The Synodal Resolution of August 19, 2010” are to be implemented across the entire Archdiocese, and are considered the policy of this Archdiocese. It is expected that all of our clergy will become familiar with these points and follow them as they are documented. This implementation is entirely consistent with the resolution of the Holy Synod of Antioch dated August 19, 2010 and will insure the good order and strong unity of this Archdiocese.